I should probably start by mentioning that Grandma Helen is not my grandmother. She is my good friend Mitzy’s grandma, who I have dined with on numerous occasions when I’ve tagged along on Mitzy’s trips home to New York for Jewish holidays. For Passover 2009 (I think) Grandma Helen made this chicken dish, and I enjoyed it so much I asked her for the recipe. The recipe takes only 40 minutes to make, and is perfect for a quick after-work dinner. It would pair well with a simple rice dish like rice pilaf or any vegetables. I should note that I made one small change the original recipe and used boneless chicken breasts instead of bone-in. You could just as easily use the sauce on any cut of chicken including drumsticks and thighs, just be sure to adjust the cooking time. Wash the chicken under running water and place them in a baking dish. Wash your hands carefully with soap and water. In a small saucepan over medium heat add the butter and cook until its just melted. Remove the pan from the heat and pour into the butter the honey, mustard, salt, and curry powder. Stir well to create the honey-mustard sauce. Spoon half of the sauce onto the chicken making sure it coats each of the breasts. Bake the chicken for 15 minutes. 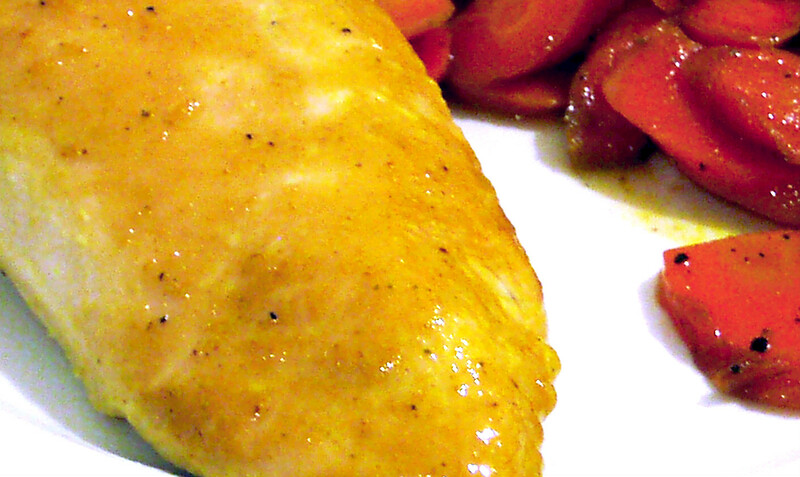 Carefully take the chicken out of the oven and spoon the remaining sauce over the chicken. Bake for another 15 minutes or until cooked (the center of the chicken should be opaque and any juices should be clear). Serve the chicken with your favorite side dish and enjoy!